My first post folks so please be gentile. I’ve been watching the site for some time and really appreciate the content. I own three tin boats and have started a refurbish of my largest, a 1994 Tracker Magna 19. It’s not lived a gentle life with previous owners and it’s time for some work. I’ve read much about the questions I’m about to ask on this site but would like to run it by the group for peace of mind. First off, I’m going to replace about 60 solid rivets. Boat has been stripped, is upside down in the garage, rivets have been removed, holes prepped and have rivets in hand. I bought 1/4” x 3/4” wide domed brazier head rivets. Head diameter is .65 vs. Standard .52. 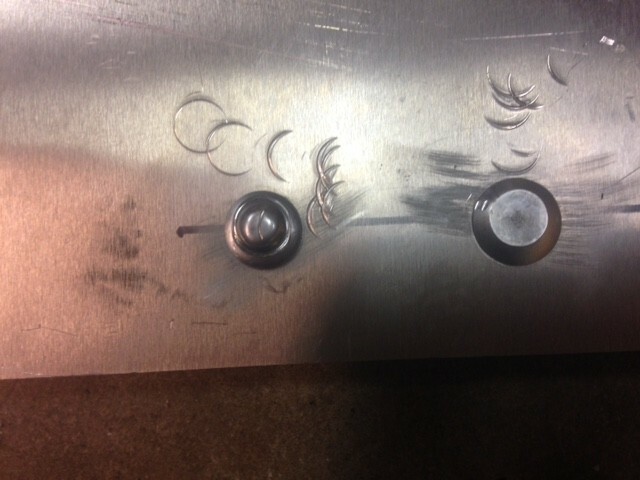 Problem is my largest rivet set is 3/16” and it left a divot in the head. I tried my flat set. It worked but left a flat spot on the rivet head. Called McMaster Carr and they suggested 1/4” set part number 6104A49. When asked about the wide dome, they said it works on that too. I’m a little suspicious. Question is, does anyone know if the dome angles are the same and if that would work? Would anyone just set them with the flat set? Second question is about wanting to remove old pop rivets from the transom prior to paint. They were from mounting a number of items over the year. Plan is to drill the out and fill with a Loctite 2 part epoxy that is suitable for aluminum sand and paint. Any issue with that? Lastly, there are some bolts/screws OE (not sure, haven’t removed them yet) in the transom with decaying rubber washers on them. What do I replace them with or just loosen them and seal with 5200? I hope to post something on the project forum on this boat in the future but being that I’m pushing 60 and much more familiar with a chain saw, sledge or a cutting torch than posting pictures on a computer, only time will tell. concerning your rivet tool being too small. the same size as your rivet head. Use that as the bucking bar. For a really tight fit and good seal, do not make the dimple deeper than the rivet head. Hold the bar on the rivet head and flatten the tail end of the rivet. I used a 10" piece of an old PTO shaft from my tractor. so anything heavy will work. holes in my old Crestliner. They are still solid today. sand smooth to remove all contaminants. Clean disk and hole area with acetone to insure good adhesion. to make a paste such as micro-bubbles or cabosil. epoxy is not UV tolerant - so it "may" degrade over time if not painted. IMO - Bondo does not work as well as the epoxy. I think the epoxy is more flexible than the Bondo. (just my opinion). 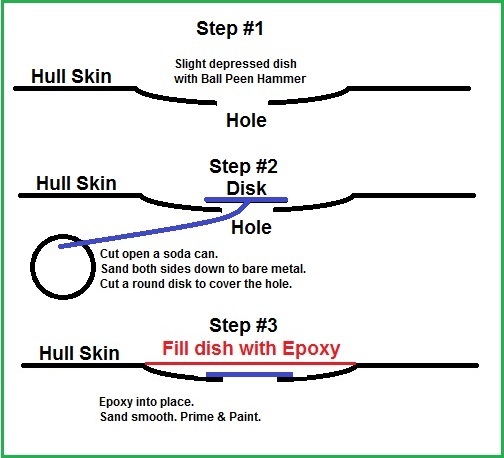 There are several ways to seal holes in a tin boat. just pick the one that suits your needs and skill level. provide you with accurate feedback. Last edited by Johnny on 28 Jan 2017, 14:56, edited 2 times in total. I was intending to use my air hammer to set the rivets. I was under the impression that the rivet set went on the head and the bucking bar went on the tail. Is it acceptable to make a bar as you suggested for the head and use my flat set in the air hammer for the tail? Seems plausible. On the second part, I may be misunderstanding. I'm only looking to plug old 1/8" rivet holes in the transom. it seems like there is enough thickness in the transom that I could just fill the hole and sand it down. I could be wrong. 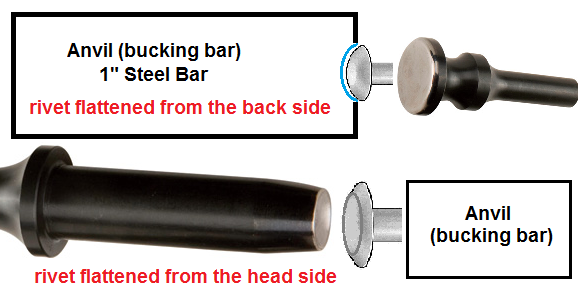 the commercial rivet tools that I see only cover the head of the rivet and not anything else. The procedure that I came up with is the Rivet Buck drawing pictured above. pounded on the back side without deforming the rivet head or the boat hull (of which you desire). try it to see if it fits your needs. if not, you will have to make your own rivet set tool the size of your rivets. as you know, using the correct tool for the job will provide the most satisfactory results. "one size does not fit all" . . . thus the homemade-handcrafted speciality tools come into play. I'm sure you can fabricate the dimpled bucking bar similar to my drawing. Try it out. Last edited by Johnny on 28 Jan 2017, 13:59, edited 4 times in total. Thanks again Sir. Wish I knew now what I'm going to know when this is done. I'm going to try and post a few pictures here and see what happens. 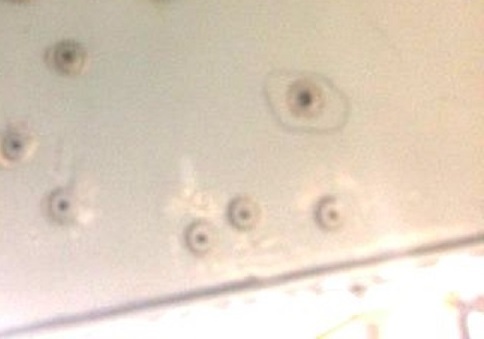 The first picture is of solid rivets on a few test sheets. One is set with an air hammer and a 3/16" set. The other is with a flat set. These are the rivets that are going into the keel. Second picture is transom with the little pop rivets I want to fill and the screws with the degraded washers. Dang it. Two post of the same picture. Mark, I am guessing the last photo is upside down. they appear to be below your transom wood ? with the washer on the inside and apply a dab of 3M-5200 on it - or solid rivet if you prefer. Johnny You are good. Great info from your posts. The photo is right side up...the boat is upside down! Pop rivets have transom wood behind them. Holes don't even go all the way through. Some seem to stick out a little from the surface and may be letting water into the transom wood from the outside. They gots to go. I often say - - - - "in MY world, I would.............."
so, I would redrill the offensive holes, maybe 3/8"-1/2" deep into the wood. this will allow the pop rivet to work as it should and seal the hole in the metal permanently. letting water into the transom wood from the outside". 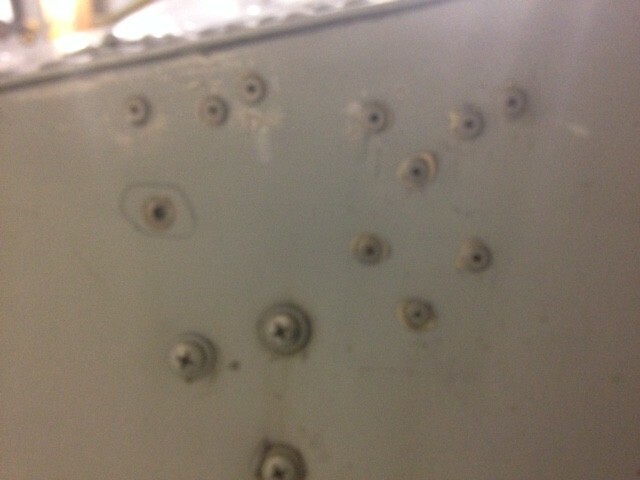 - or - (#2) the P/O did not drill into the wood to put the rivets in ???? and you are very correct - water may have leaked into the wood [for years]. keep checking the wood for possible rot. when you drill new holes for the new rivets, examine the wood dust that comes out for wet spongeness. Johnny, you are a marvel! I have been called many things - but never a marvel ! !